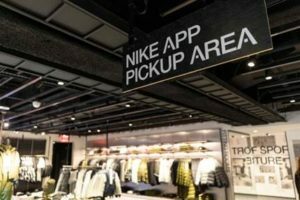 The key to the Speed Shop is the Nike app’s retail mode, which pops up when the app recognizes that you’ve entered a retail store. Retail mode allows customers to request items, unlock their locker, and check out in-store. “You’ll have a whole other layer,” Hoke says. 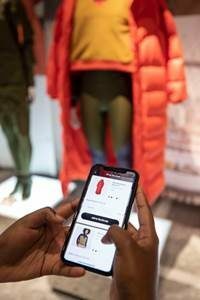 “There’s a plural reality of the physical space and digital space.” The app unlocks convenience elsewhere in the store as well: If you’re shopping on one of the apparel-focused floors and you see a mannequin with a vest you really like, you no longer need to hunt for it elsewhere on the floor. 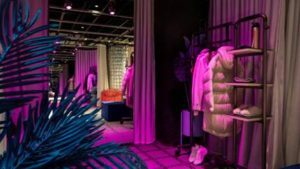 Instead, you can scan a QR code next to the mannequin, and every piece of clothing in the look will show up on your phone. Then, you can request whichever ones you want to be sent to a fitting room, in your size. You can also scan any other product in the store and request it to be added to your room. 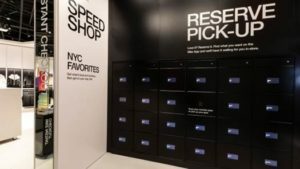 On the sneaker-dominated floor, you can scan shoes to learn more about them, and request that a store associate bring you a particular shoe in your size entirely through the app. Best of all, when you’ve decided what to buy, you don’t need to stand in line. You can check out in the Nike app using the same payment methods that you’d have for the online store. 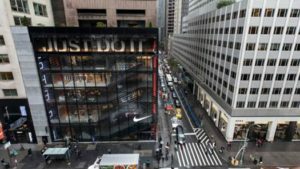 Because the Nike team found that people were sometimes confused about this process, they created small stations on each floor that are designated as Nike self-checkout points. Each of these has a place for shoppers to leave hangers and to grab a bag for their purchases. But there is a catch. For all these conveniences to work, you have to be a Nike member (which is free), have the Nike app, and allow it to track your location. That’s because the company wants the app to be able to recognize you the second you walk into a store and send you notifications when you’re nearby. That’s a lot of access to give a sneaker company about your whereabouts. A few days after I’d set up my account, my iPhone sent me a follow-up reminder that Nike was still constantly tracking my location, and verifying that was something I really wanted. Now that I’ve experienced the store, I’ll be adjusting my settings so that Nike only gets access to my location when I open the app. All of the features will still work with this setting.